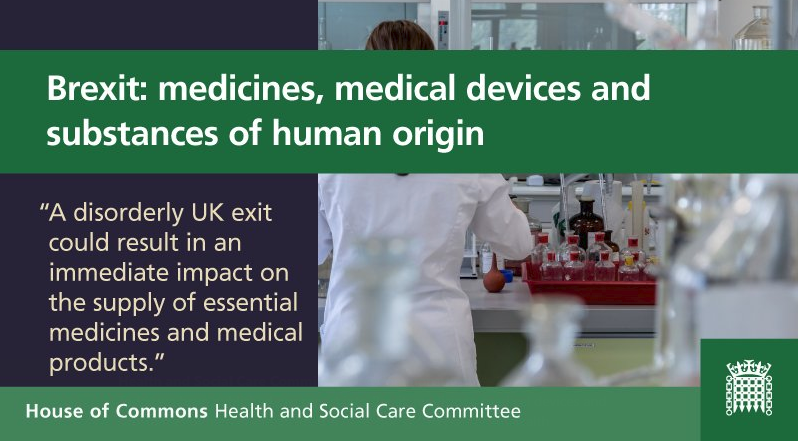 The Health and Social Care Select Committee has today published its report following the conclusion of its inquiry into the impact of Brexit on medicines, medical devices and substances of human origin and call for close regulatory alignment between the UK and the EU. Committee Chair Sarah Wollaston MP stated that failure to secure the closest possible regulatory alignment ”would signal a triumph of ideologies over the best interest of patients”. Calling for greater clarity on preparations for Brexit so that industry has sufficient time to prepare for changes around the future regulatory and operating environment and urging the Government to publish their contingency plans as soon as possible. Calling for a commitment to implementing both the Life Sciences Industrial Strategy “at pace” and the Accelerated Access Review. Urging the Government to ensure that the UK remains a member of EU R&D funding and research mechanisms such as Horizon 2020 post-Brexit. The report also acknowledges industry concerns around the impact Brexit may have around continued access to high-quality researchers and staff as well as possible changes to the supply chain; both were mentioned in the Alliance’s written response to the inquiry and the Committee has expressed its support for free and frictionless trade with the EU. The Committee have also made recommendations in other areas, including calling for continued access to Europe-wide clinical trials.